In a previous post, I wrote about sermon preparation and the importance of the sermon illustration in that process. Sermon illustrations are pretty easy to come by if one is paying attention. The problem for me has been how to keep track of the illustrations I have found along the way but have not been able to use yet. How can I file those illustrations to be used in the future? What system is the best way to access my sermon illustrations? In my thinking and experimenting to find the best system, I also found myself in an interesting situation. A fellow minister and friend of mine passed away not long ago. His family very generously and very kindly gave his collection of sermon illustrations to me (this collection is seen in the image above). I was very honored to receive this collection of illustrations that represent hundreds of hours of collecting, filing, and then using the illustration in various sermons. This was a very personal, very important, and very valuable gift. I was quite moved by this family's kindness in their time of grieving. Recently, I have come across an application named Evernote. My finding Evernote is not an epic discovery, as many have already found an use Evernote regularly. 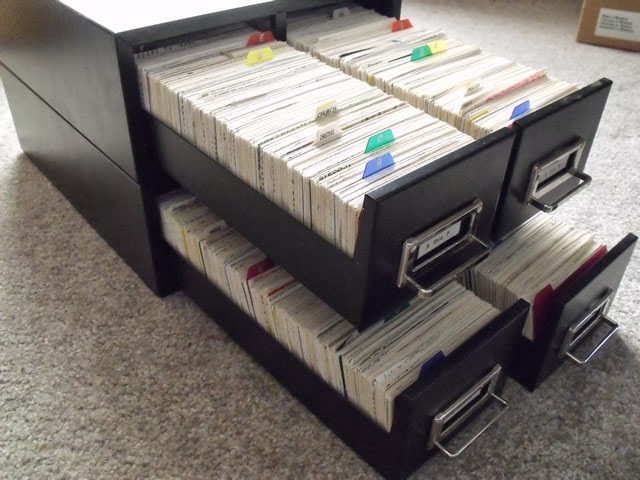 But for me, it was a great way to easily collect, store, and retrieve sermon illustrations. If you are looking for a way to make a personalized sermon illustration storage system, this is a very easy process. After I looked at some videos about the basics of Evernote, I began the process of collecting my illustrations. To begin with, I created a "notebook" entitled "Sermon Illustrations." Second, I create a new note in that notebook. Then, I use the very cool function in Evernote in which one can take a picture with the "document camera," which takes a picture of the text and then makes that text searchable. I add a title to this picture, and at the bottom of the note, I make a quick notation regarding the source. Finally, and I think this may be the most important, I create some "tags," which are essentially subject labels, for this note. Once entered like this, you can search the "tags" for a topic search, as in "I would like to see all the illustrations about forgiveness" or you can search through the notes for a keyword, as in "I would like to see all the illustrations that have the word "love" in them. All my illustrations are stored on the Evernote cloud, which has 60 MB per month free. This means that I can access my notes from my iPad, my PC laptop (there is an Evernote for the PC), or even any computer that has web access, because there is a web-based client as well. I would recommend Evernote for this type of work. I can also see the benefits of this application in collection of receipts for ministry and a vast array of information gathering. 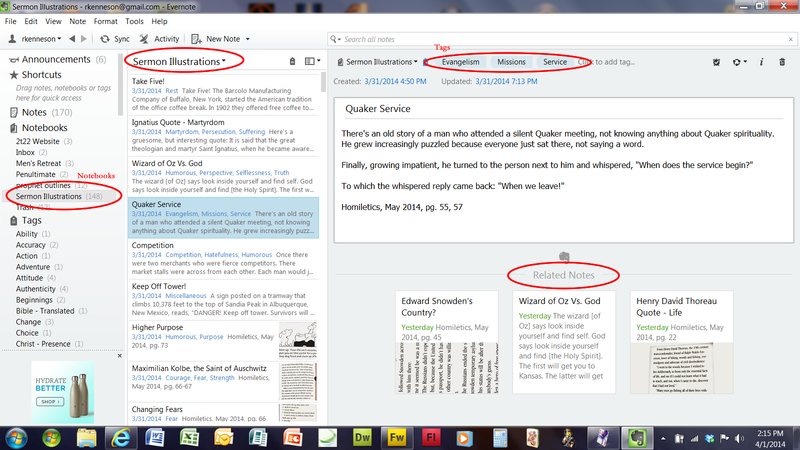 For now, Evernote will be serving as my main storage space for my sermon illustrations. Finally, I will have an image below of what my Evernote on my PC looks like (it is a large picture so you may need to scroll around to see it all). I hope this information has helped. Please leave some feedback to let me know!